This client knows the beauty of simple purity. The platform canopy bed we designed for them cannot be simpler, apart from the gently curved front of the headboard. The refined execution of the whole piece in fine lacquer however greatly enhances the mood of the bedroom space. All components are interlocked together with concealed dovetail joints. The dining table is a bespoke piece with generous dimensions, with length at 2440 mm (8 feet) and width at 1220 mm (4 feet). The two square shaped table top panels rest by tongues onto the base. The simple form is deduced from a design decision to provide the best usage experience for the seated guests. Part of the appeal of our furniture lies in the warm treatment of all corner and edges by hand. The crafting photo shown below shows the sideboard with pretty solid wood panels selected for the cabinet body. 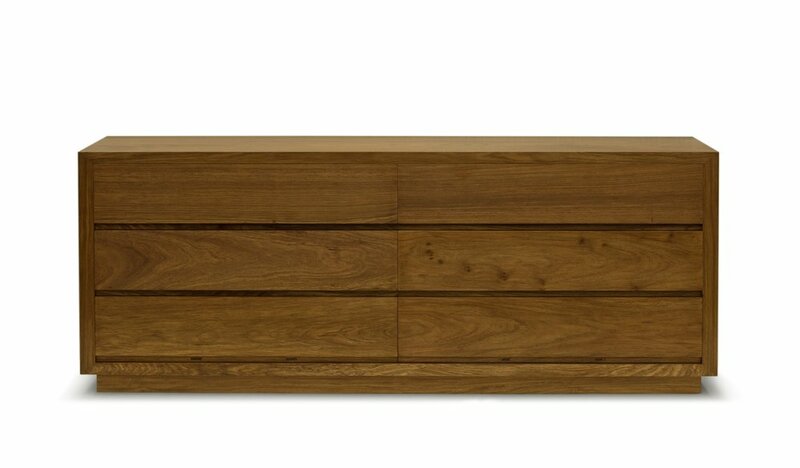 Being solid wood in nature allows us to finely sand down and smoothen all the surfaces and edges. A veneered piece by comparison will have more rigid treatment, being so thin that thorough sanding is disastrous. The crafting photos also vaguely show the joinery structure for the platform canopy bed. Within the simple form of the assembled bed lies well thought out components as well as their interlocking manner by joints. Unless one knows the locking and unlocking sequence, the canopy bed feels as if it is fully integrated as one single unit.